Register for the GSBA conference and pre-conference workshops. 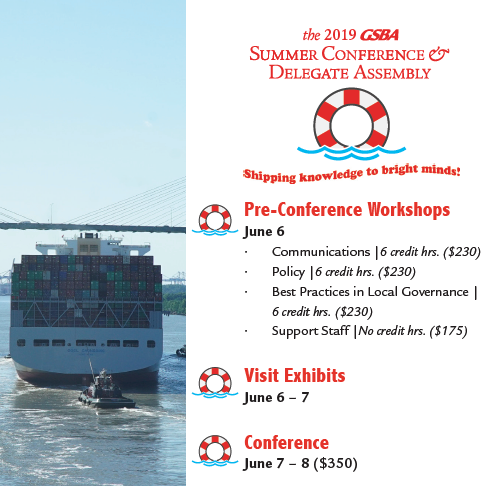 Our 2019 Summer Conference and Delegate Assembly will be held June 7-8, at the Hyatt Regency Hotel, Savannah (Pre-Conference Training will be June 6). The Hyatt Hotel is now sold out. Additional Overflow Hotels can be found here. View Summer Conf. Info Webinar as a pdf here. Thursday, 6/6 pre-conference workshops: 8:30 a.m. – 4:30 p.m.
Friday, 6/7 conference 1st day: 8:30 a.m. – 4:00 p.m.
Saturday, 6/8 conference 2nd day: 8:00 a.m. – 11:00 a.m.
New this year: Recognition Awards given on Saturday morning. Detailed Schedule, Speaker info, and Exhibitors all found in the GSBA Hub app (login required). GSBA affords local school board members a great opportunity to fulfill their annual training requirements for the fiscal year in conjunction with the pre-conference workshops given immediately prior to each conference. (see O.C.G.A 20-2-230). Exhibitors showcase their products and services at conferences on Thursday, (pre-conference workshop day) and Friday, (first day of the conference). See Business Opportunities for more information. Exhibit Registration here.